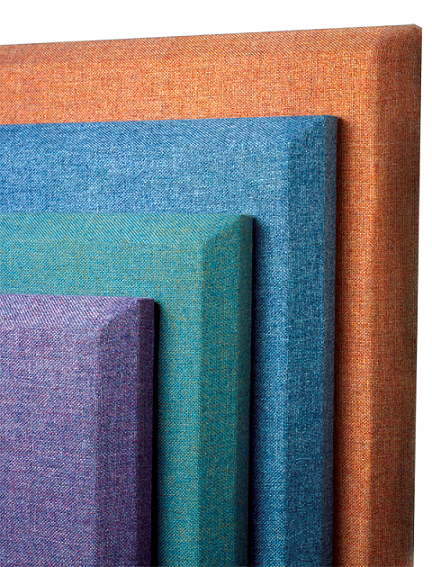 Sonora Acoustical Wall Panels, previously referred to as Respond Panels, are used to reduce echo and reverberation in applications, small and large. These panels are manufactured from a rigid high density (6-7 PCF) glass fiber acoustical board and covered with an acoustically transparent fabric. The edges on these decorative wall panels are chemically hardened and offer several edge design choices. PANEL OPTIONS (1, 2, 3) Please provide selections when ordering or requesting a quotation. Please Contact Acoustics First for any quantity pricing or a quotation for materials and shipping. Minimums may apply. Construction: 6-7 PCF rigid glass fiber core, hardened edges, wrapped with acoustically transparent fabric. The board is certified on average to contain at least 30% recycled glass, with 4% post-consumer and 26% pre-consumer content. 1" and 2" - Standard 3" and 4" - Special order Custom Shapes, odd sizes, cut-outs, alternative fabrics and manufacturing to CAD drawings can also be quoted. Adders: additional High Impact (abuse resistant) / Tackable facing is available to improve durability and tackablility while maintaining acoustical properties. Sonora® Acoustical Wall Panels 2"
Ships Via: Common Carrier Motor Freight (Freight Information) 2'x4' or smaller may ship via UPS / FedEx Service. News: Sonora Panels named Christian School Products "Top Product 2012"
Sonora® Acoustical Wall Panels are the premier choice for reducing reverberation and improving speech clarity. 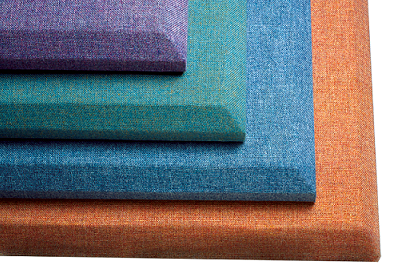 Available in many sizes and colors, these absorbers are suitable for many applications. This includes offices, worship facilities, schools, gymnasiums, museums, auditoriums, or any application that requires an acoustical solution. The products below coordinate with the Sonora series of fabric wrapped acoustical panels. » See more Fabric Wrapped Absorbers including ceiling clouds, ceiling tiles, baffles and corner traps. » A full line of diffusion products are also available.